It’s time to look at a retro game from the good ole days. It’s pretty nostalgic when you start the game up as you still hear the classic Capcom logo and all of the sound effects are very retro. It’s like getting that arcade feeling while still having the polished graphics from a modern game. 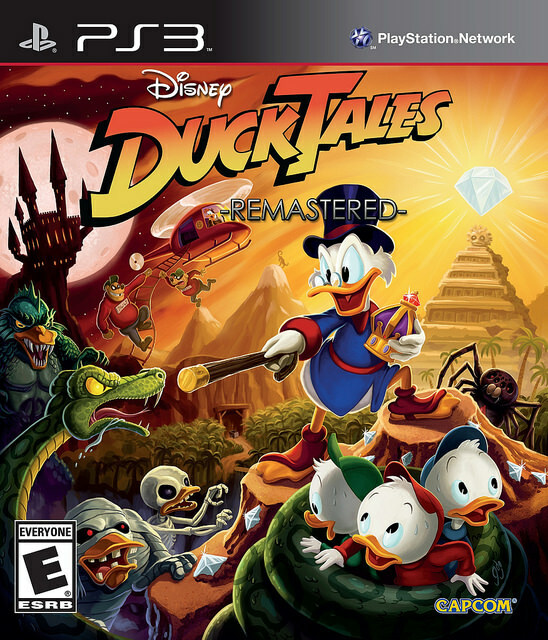 Ducktales is a solid adventure for fans of the series as well as fans of the genre and is reasonably challenging as well. The game starts off with Uncle Scrooge’s home being broken into by the Beagle Boys. They capture Scrooge’s 3 nephews, but the old Uncle is more than a match for the thugs. Scrooge then comes across a painting which works as a map and points to some legendary treasures. He decides to go and snag all of them, but the convenience of this map does make you wonder. Is Scrooge merely dancing to the tune of an unseen manipulator or is he simply leading the charge and got a lucky break? Our fearless main character is about to find out one way or the other! When it comes to the gameplay, Ducktales has a very simple control scheme that is easy to pick up and play, but rather difficult to master. You move and jump as you go from one stage to the other. The main gimmick that Scrooge has is his cane which you can use to jump on enemies or even on spikes. You hold the O button to take out the pogo stick while in the air, but if you decide to play on Extreme Mode then it’s a two button combination of Down and O. You typically have to find a few objects which are labeled on the map. Once you find them, then you can head to the end of the stage and face the boss. I should mention now that I’m glad the objects are clearly labeled. It would just add unnecessary duration if I had to actually search for them all and get lost a few times. It’s not as if the levels are huge, but I think that this is a reasonable accommodation for the player. There are 6-7 stages I believe. You can choose any of them to start out with first after the tutorial level and not counting the actual final. I went in order from top to bottom but the difficulty will really depend on which boss you find the most intimidating. They are all pretty tough the first time around, but gradually you’ll learn the patterns and do better the next time. Quite a few of the bosses took me two tries. It’s hard to sit back and memorize the patterns without getting hit, but this way it’s a life well spent. Surprisingly the final boss is one of the easier ones as out of Dracula’s 3 special abilities, one is really easy to dodge and the other two are pretty manageable. He does have more health than the other bosses which helps to balance that though. It’s a good amount of difficulty that tests your strategic thinking without being overly grindy. It’s a good balance. You start the game with 3 hearts, but there are 5 upgrades that you can find in the levels. Grab all of them and your health will really be ready for the boss fights. Upgrades are really key in this game and the last parts would have been a lot tougher without them. I found 3 on my way to the goal, but I’ll look for the other two someday. The toughest part of the game actually isn’t a boss though, but the running challenge after it. In a scene much like a Mario game, you have to outrun the lava that is quickly creeping up on you. I died quite a few times during this part as the level is quite difficult. Make one mistake and you’re done. Even if you don’t make any mistakes you can still lose if you weren’t quite moving fast enough. Just keep on doing the level and eventually you will be able to clear it. The main campaign is pretty short so you’ll have it beat in around 3 hours or so. Add in a bit of time depending on how often you die. There is replay value as you can keep clearing levels to buy all of the collectibles and earn trophies. The trophy collecting may lose some incentive since there are no Gold or Platinum trophies in the game. It’s a little surprising. Also, you have to beat the Game on Extreme, which means beating the whole game in one siting with only 3 lives. That sounds crazy hard so I already know that I won’t be getting all of the trophies in this game. Still, I got most of them so I’m still pretty satisfied in the long run. This is really a game that you complete once or twice and move away from it so it’s just important that you enjoy the initial run. Fortunately I can say that I did enjoy the game. The story is quite solid and the writing is great as Scrooge has a lot of witty dialogue. He’s certainly a quick talker and always has a quip for the situation. His rival also made for a good antagonist. His constant insults during the last level are enjoyable for sure although Scrooge still gets the last laugh. The witch was a good villain, but a little overpowered. Since she can just stop time whenever she likes, I don’t see how the heroes can ever truly defeat her without plot hax. She just seems to be way stronger than the rest of the cast since everyone else is powerless. They’re just ducks. Count Dracula had a nice appearance even if he was completely used as a pawn here. He didn’t even get any lines in defiance! The soundtrack is pretty solid. The level themes are memorable and in particular the final level has a great theme. It’s definitely a soundtrack where you can tell that a lot of effort was put into it. I do miss these retro soundtracks from back in the day and Ducktales definitely hit all of the right notes. The animation also looks really good as it’s about as HD as you can get for an old side scroller. The levels all look very clear whether they are in the light or in a dark cave. Overall, Ducktales Remastered is definitely a very fun game. It’s a short one, but an enjoyable game nonetheless. You’ll have fun mastering all of the levels and making your way to the end. It’s a game that rewards your effort and each death will only lead you closer to victory. I’d love to see another game with Uncle Scrooge since he’s such a lead. The game’s ending just proves that point all the more as he’s just a nice uncle. He helped the nephews feel like the celebration was their own as well. Just don’t ask him for any money and you’re all set! This entry was posted in 7 Star Games, Game Reviews, Games, Reviews and tagged Disney, Disney Review, Ducktales, Ducktales: Remastered, Game Review, HD, Platformer, Playstation, PS3, Remake, Review, Sony, Uncle Scrooge, Video Game Review by dreager1. Bookmark the permalink. I played Duck Tales on Gameboy back in the day. This remake was fun. I didn’t mind the short length, as I downloaded the game for free via PS Plus. Good thing that I am not a trophy hunter because beating the game on Extreme sounds impossible. I really need to buy this just for Alan Young. RIP.